Samsung remains a dominant force in the premium smartphone segment. But it has been facing fierce competition in the mid-range and low-end segment from Chinese vendors like Xiaomi, Oppo, and Vivo. The company’s Galaxy A and Galaxy M series phones aim to thwart the competition. 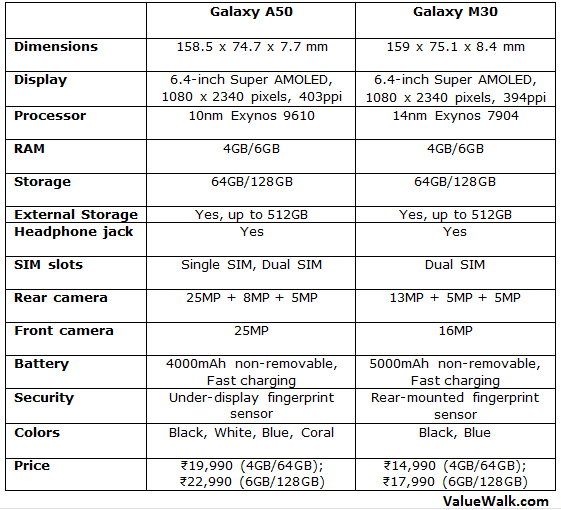 But what’s the difference between the latest Galaxy A50 and Galaxy M30, both of which were released earlier this month? And which one is a better buy? Let’s dive into a detailed comparison of the two phones to help you decide. At first glance, the A50 appears to be an identical twin of the M30, but there are noticeable differences. They both have a reflective back panel which feels premium but attracts smudges. The A50 comes in four different colors – Black, White, Blue, Coral. In contrast, the M30 is available only in black and blue color options. Samsung has used USB Type-C connector on both the phones. Fortunately for fans, both handsets retain the 3.5mm headphone jack. Neither device is fully bezel-less because they both have a noticeable chin at the bottom of the screen. Both the handsets get the same 6.4-inch Super AMOLED display with 19.5:9 aspect ratio and a Full HD+ resolution of 1080 x 2340 pixels. The Super AMOLED display offers excellent color reproduction and viewing angles. The screen on both devices is bright enough to offer a good viewing experience even under direct sunlight. Where the two phones differ is the pixel density and screen-to-body ratio. The A50 has an 84.9% screen-to-body ratio and 403ppi pixel density. In contrast, the M30 has a higher 88.1% screen-to-body ratio but a slightly lower pixel density of 394ppi. It means the M30 has slimmer bezels than the A50. Both the handsets run Samsung’s in-house Exynos chips. 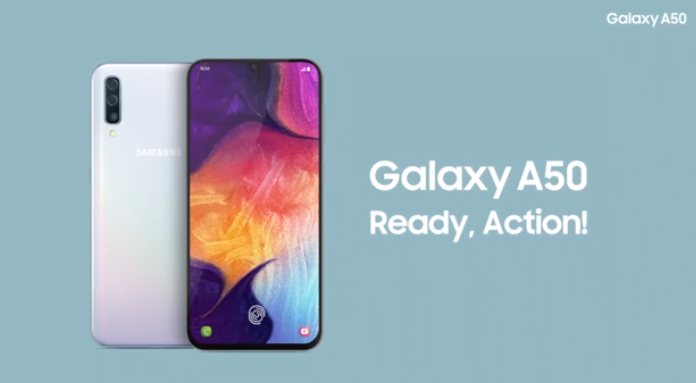 The Galaxy A50 gets 10nm octa-core Exynos 9610 processor with Mali-G72 GPU. It comes in two different RAM and storage options of 4GB/64GB and 6GB/128GB. In contrast, the M30 gets a slightly less powerful 14nm Exynos 7904 with Mali-G71 graphic processor. Just like A50, it comes in two variants: 4GB RAM with 64GB storage, and 6GB RAM with 128GB storage. The RAM and storage is sufficient for most users. But neither phone is powerful enough for high-end gaming or extensive multitasking. The 6GB variant of both handsets offers a better experience and faster app loading. If you want additional storage, both handsets include a microSD card slot with support for up to 512GB of external storage. You will never have to worry about battery life with either phone. The Galaxy A50 packs a giant 4000mAh battery, which offers more than a day of normal usage. It supports 15W USB Type-C fast charging. Despite the fast charging support, the A50 takes about 90 minutes to go from 0% to 100% due to the large battery size. The M30 gets an even bigger 5,000mAh battery that could easily get you through two days of normal usage. This too supports fast charging via USB-C. Fully charging the M30 takes more than two hours, but you are unlikely to complain because of its impressive battery life. This is where you will notice the biggest difference between the two phones. The A50 features a 25MP primary lens with f/1.7 aperture, an 8MP ultra-wide angle sensor with f/2.2 aperture, and a 5MP depth sensor with f/2.2 aperture. On the front, it gets an impressive 25MP camera with f/2.0 aperture. You also get a bunch of other features such as Live Focus, Panorama, Slow motion, Pro mode, Hyperlapse, AR emojis, and HEVC support. Both phones take good pictures in bright light situations, but struggle under low-lighting. The cameras are excellent for the price point. The M30 also gets triple cameras on the back consisting of a 13MP primary lens with f/1.9 aperture, a 5MP ultra-wide angle lens with f/2.2 aperture, and a 5MP depth sensor with f/2.2 aperture. It features a 16-megapixel selfie camera with f/2.0 aperture. For authentication and security, the Galaxy A50 features the same in-display ultrasonic fingerprint sensor as Samsung’s latest Galaxy S10 flagship. It’s fast and secure, and allows you to unlock the device by putting your finger on the screen. The M30 has a rear-mounted fingerprint sensor, which is fast and secure. But it’s not as convenient as the in-display sensor of the A50. They both are Android phones, but there is a huge difference between them when it comes to software. The A50 runs Samsung’s new One UI skin on top of Android 9 Pie. The One UI skin offers fast and intuitive user experience. It uses the top half of the screen to display content and the bottom half for navigation. It keeps the navigation options within the reach of your thumb. The M30 runs an older Android 8.1 Oreo with Samsung’s older Experience UI. However, the software is well-optimized, so you won’t feel any lag during normal usage. Both these phones offer excellent value for money, and they are both aimed at emerging markets such as India. The Galaxy A50 costs INR 19,990 for the 4GB/64GB model in India while the 6GB/128GB version costs INR 22,990. In contrast, the M30 is a little more affordable. It costs INR 14,990 for the 4GB/64GB model and INR 17,990 for the 6GB/128GB version. At their respective price points, both handsets tick all the right boxes. If you want to buy either of them, go for the 6GB RAM variant of Galaxy A50. It offers more power, the latest Android Pie software with One UI, and better cameras.